When rooms are opened into IMVU the perspective seen by the viewer is determined by a camera set up typically directed at seat01 (it can be pointed at any aspect of a room). In Blender this feature is defined by two nodes; the camera, camera.01.01.root, and its target, camera.01.01.root.Target. Together the they establish the cameras position, orientation and how close or far the camera can be moved to/from whatever the viewer is looking at as they navigate the room, similar to zooming a camera. With the availability of FBX rooms can now be made using nodes, Empty’s, instead of, or as well as an Armature and Bones. Cameras. 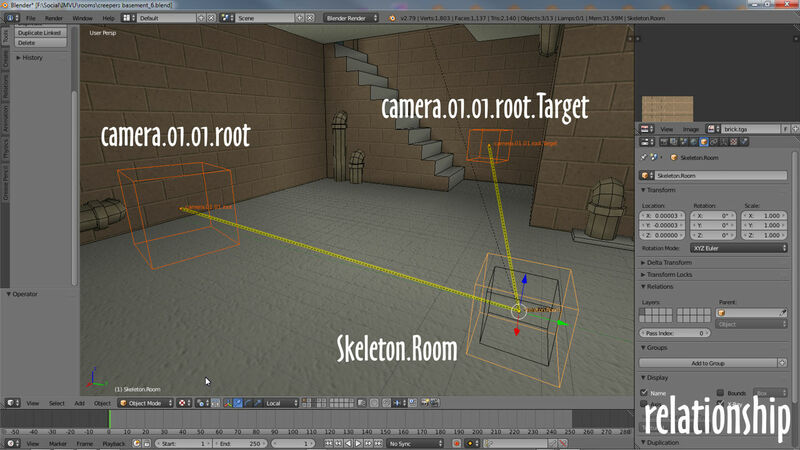 Rooms are viewed from the camera nodes point of view (camera.01.01.root) which looks directly at the target node (camera.01.01.root.Target). When manipulating the camera nodes its important they are properly aligned regardless of the distance between them; to work correctly the camera node always points at the viewer, essentially backwards. On the other hand the camera target points away from the viewer forward into the scene. In essence the two nodes align back-to-back, the distance between them, and their rotation relative to the scene, being the only variables that won’t break the feature. Using Local transformation orientation the (blue) Z axis of both nodes align to the horizontal plain, pointing backwards/forwards, up is indicated by the nodes (green) Y axis – nodes may move in opposite directions in Local due to manipulation being relative to their individual orientations, switch back to Global to manipulate. 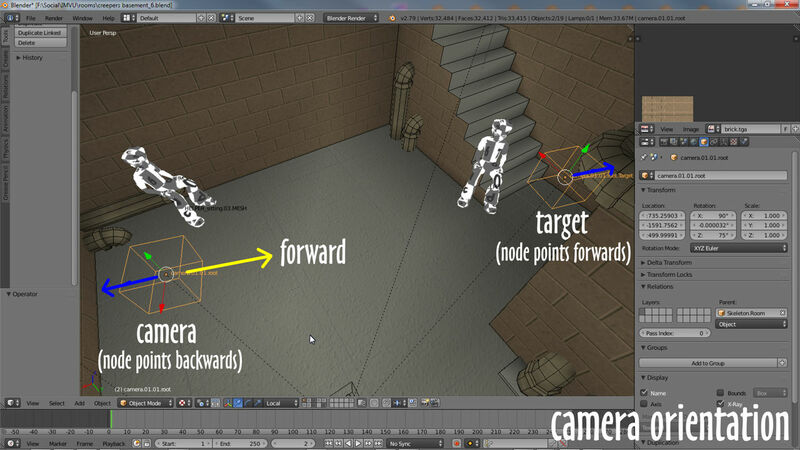 In Blender camera nodes point in opposite directions (indicated with blue arrows above), the camera towards the viewer, the target away from. Once camera.01.01.root and camera.01.01.root.Target are positioned/rotated they must be linked to Skeleton.Room using Parent – Shift+right-click both nodes, Skeleton.Room last, then from the Object menu select Parent » Object, Object (Keep transform). When Parenting always use Object (Keep Transform) as this links objects together without resetting their location/rotation. Relationship. 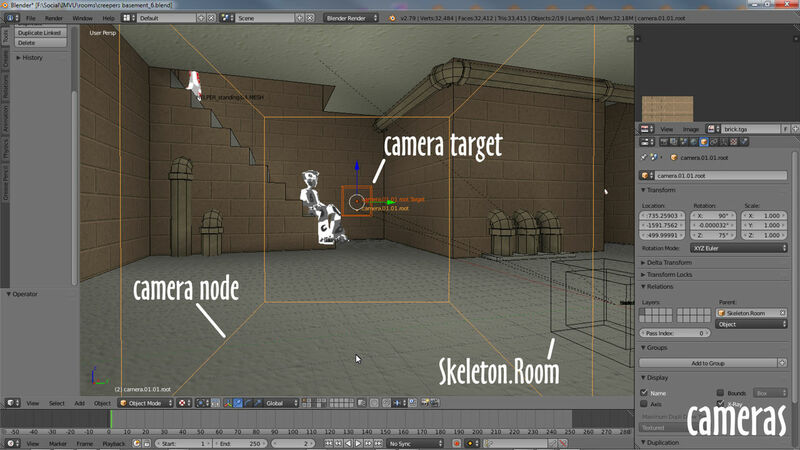 Parent both camera nodes to Skeleton.Room – select Skeleton.Room last to ensure the relationship is correct, camera nodes being children of Skeleton and not the other way around.